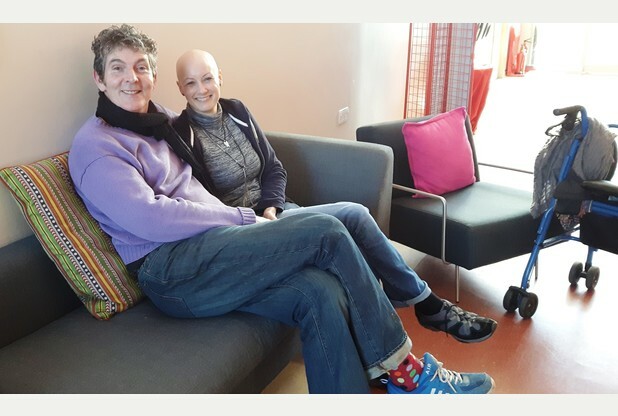 Two multiple sclerosis sufferers who met while waiting to use an oxygen chamber in Bradley Stoke, will this year celebrate their third Valentine's Day as man and wife. Becky Stone first laid eyes on Andy Joyce when she was coming out of the Oxygen Chamber at The West of England MS Therapy Centre. And it was love at first sight. She said: "I would see him smiling at me each time I was leaving the chamber. There was a time he didn't come to the centre for a few weeks and I really missed him. Then the next time he came to the centre, I said I had missed seeing him. From that point onwards we would always have a chat. Andy said: "I was attracted to Becky straight away, her beautiful smile and the more I talked to Becky the more beautiful she was to me. "I knew Becky's birthday was coming up, I asked her what she was doing on her special day; Becky said she had nothing planned. I suggested we go out for a steak meal to celebrate and we started dating from then. "I knew after a few months Becky was the one for me, we had been dating for around eight months and were invited to a friend's wedding, I asked Becky casually how long do couples usually wait before they get engaged, Becky said I don't really know, I would imagine a year. I asked Becky to marry me on our first years' anniversary." At the age of 20, Becky was diagnosed with Multiple Sclerosis which affects the nerves in the brain and spinal cord, causing a wide range of symptoms including problems with movement, balance and vision. Becky has been living with the condition for 18 years and has been coming to The West of England MS Therapy Centre for 12 years. She said: 'I have Oxygen Treatment; it helps with my fatigue, my vision, to think clearly and to have a good night sleep. It also helps with my bladder management'. These are some of the symptoms of MS. Andy was diagnosed with MS three and a half years ago, and has been having Oxygen Treatment for three years at the centre. The treatment helps with fatigue and keeps his MS symptoms at bay. 'On Valentine's Day Andy and I plan to take a romantic stroll along the beach, and drink banana milk shakes - we love them. "Andy will help push Josh (Josh is Becky's nickname for her rollator) and we will snuggle up because he keeps me warm and safe' said Becky. 'Maybe The West of England MS Therapy Centre could have speed dating nights because it worked for us and it is a great place to meet people. Plus it would bring in much needed funds for the centre. Our treatments are heavily subsidised by the Charity and without the centre I would not have met Andy, be able to look forward to the future and have a loving relationship'.